Bret had only recently won the title from Ric Flair in Saskatoon, with the story being that he was going to be a fighting champion who took on all comers, thus why he was defending the title here against fellow babyface Virgil. Virgil hadn’t been getting much of a push during this period, with his last high profile match being a pulverising defeat at the hands of the convict Nailz. We have a handshake to start before going to some amateur styled wrestling, which Virgil surprisingly does quite well in. Virgil tenaciously holds onto a headlock, whilst Heenan says that Bret is going to eventually burn himself out if he keeps defending the title with such regularity. Bret eventually starts roughing Virgil up with strikes and slams, positioning himself as the subtle heel. Virgil replies with some shoulder barges in the corner and then gets a big monkey flip out of the corner for two. Virgil tries a cross body from the second rope, but Bret dodges it and then applies The Sharpshooter to pick up the clean win. This felt like a longer match that got chopped up in the edit to be honest. That being said, Bret probably shouldn’t have been selling that much for Virgil at this stage anyway, so chopping the match up into Virgil getting a couple of moves in before getting cleanly beaten was probably the best way to present things. Meanwhile, we get a special bulletin from Mean Gene Okerlund, as he hypes up one of the big matches for the upcoming Survivor Series. Originally, Randy Savage and The Ultimate Warrior had been due to face Ric Flair and Razor Ramon in a tag match. However, Warrior left the WWF weeks out from the show, so Savage needed to find a replacement. Savage decided to pick Mr. Perfect, who was Flair’s “executive consultant” at the time. Perfect originally laughed it off but, after Flair dismissed how well he’d do in the match, he eventually decided to take up Savage on the offer and dumped a pitcher of water over Bobby Heenan to seal his face turn. I love this angle and I really wish that they’d upload the whole episode of Prime Time Wrestling that it aired on, because the story of Perfect gradually deciding to accept Savage’s offer throughout the show is great stuff. 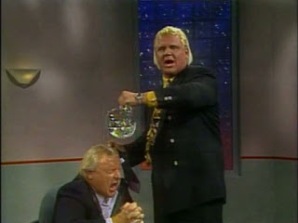 Heenan getting angry at Perfect for accepting and then begging off in classic heel fashion is an absolutely amazing performance that really gets the storyline over. Back from the break, McMahon mocks Heenan over Savage teaming up with Perfect, which causes Heenan to go on a rant about how he and Ric Flair made Mr. Perfect. Fuji was still in his Oddjob suit and bowler hat attire here, although he would eventually change to his more traditional Japanese garb once the New Year rolled in. Yoko was still quite new to the WWF at this point and had been squishing enhancement talent on television. He does exactly the same here on Superstars, as he clobbers poor Becker with ease before crushing him with a Bonzai Drop. I don’t rate squash matches, but this was a very impressive one from Yoko, as he looked like an absolute monster here. You can see why he got such a push, of the back of this. Sadly he just kept getting bigger in size, which did a real number on his mobility. Early on in his run though he could still move and was a decent heel attraction. We cut to the WWF Event Centre (Sponsored by ICO PRO) with Sean Mooney. 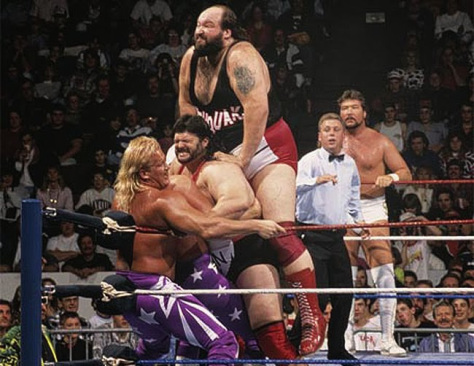 Mooney states that Yokozuna has signed an open contract for Survivor Series (Virgil would eventually accept and get squashed) and then hypes up an 8 man tag team bout on the show featuring The Natural Disasters and The Nasty Boys taking on Money INC and The Beverley Brothers. Mooney sends to a promo from The Nasty Disasters, focusing mostly on Money INC. Basically, both teams had been under the management of Jimmy Hart but he betrayed both of them at separate periods in order to aid Money INC, so both teams are now gunning for revenge. Ironically Hart would soon go babyface himself and start managing Hulk Hogan and Brutus Beefcake in 1993. We now cut to a segment with Lord Alfred Hayes, where he shows highlights of Shawn Michaels defeating British Bulldog in a match for the Intercontinental Title on Saturday Nights Main Event. This ended up being due to Bulldog leaving the WWF due to a supposed drug test failure. The match featuring the title change was pretty great and definitely worth a look if you have the WWE Network. It’s the SNME episode from the 14th of November 1992. 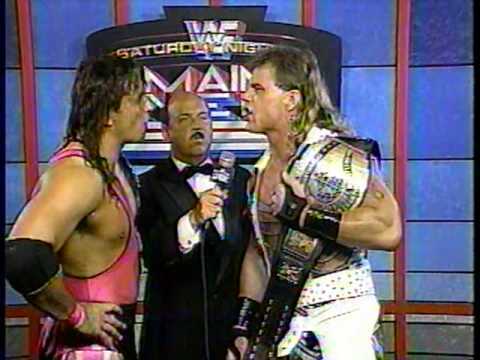 We also get clips of Bret Hart defending his WWF Title from the same episode of SNME. Bret won a tough bout cleanly with The Sharpshooter and we then see an interview he had with Mean Gene. Hart will face Michaels at the Survivor Series, and Michaels interrupts his promo and gets in his face. Unlike in 1997, Hart and Michaels were actually on good terms in real life at this time and they ended up having a very enjoyable match at Survivor Series. This is yet another squash match, as The Disasters easily dismantle their enhancement talent opposition, whilst an inset promo plays from The Beverley Brothers and Money INC. They say a couple of catchphrases and then laugh villainously. 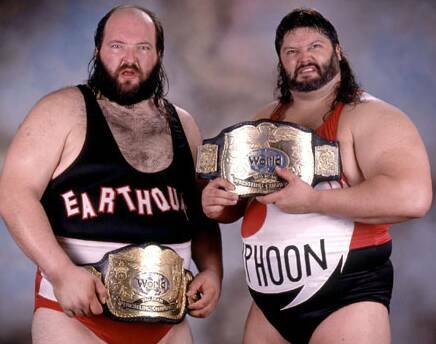 Earthquake and Typhoon hit Walker with their respective finishing moves (The Aftershock and the Typhoon Splash) and that’s enough for an easy win. I’ve never been an especially big fan of Typhoon but I’ve grown to really enjoy and appreciate the work of Earthquake over the past few years, so the whole TND act has grown on me as a result. Back from the break, we get more Survivor Series hype, as they’re really going for the big hard sell here. 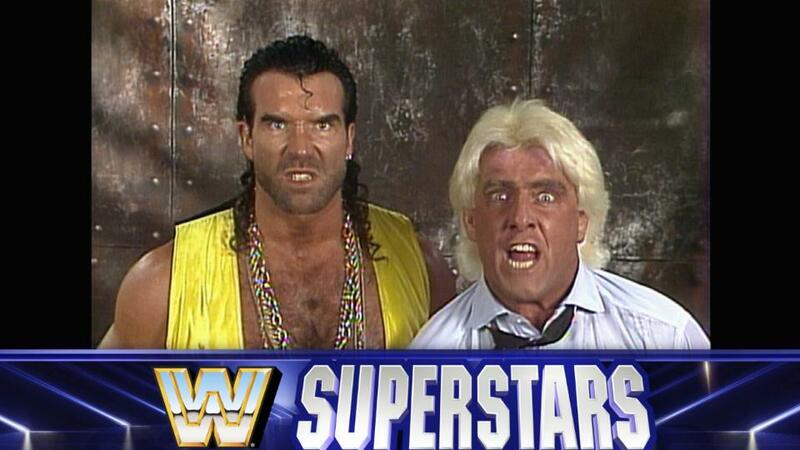 Ric Flair and Razor Ramon cut a great angry promo ahead of their tag match at Survivor Series. Ric Flair is near maniacal and his face is almost beet red by the end, it really is fantastic stuff. We get promos from Nailz and Big Bossman next, ahead of their nightstick on a pole match at Survivor Series. This was one of the all-time silliest feuds that the WWF ever did, as Nailz came out of prison looking for vengeance on Bossman for supposed mistreatment when he was behind the bars. The fact that Nailz cut promos actually from prison where he outright threatened the Bossman, only to then show up at Bossman’s place of work following his release and brutally assault him, didn’t seem to bother the prison service that much. It made no sense that they’d let him out after he’d made all of these threats. I mean, they could have at least filmed a scene in front of a parole board where he tried to convince them that his tattoo actually said “The Bossman, The” or something in an effort to explain why they let him out? Something tells me that Bossman would have one heck of case if he wanted to file a lawsuit. Mean Gene also reveals that Owen Hart and Koko B. Ware will be taking on Samu and Fatu at Survivor Series, before sending to another promo from Whippleman and Kim Chee, where they essentially repeat what was said earlier. We get a video promo from Bam Bam Bigelow, where he says he will engulf the WWF in flames next week. Cassidy was a gimmick given to Steve Armstrong, who had enjoyed a decent run in WCW teaming with Tracey Smothers before coming to the WWF. He didn’t last very long in this incarnation and you can tell that he wasn’t very over with the crowd as they have to dub in quite a bit of fake crowd noise to make it sound like the fans even care about him. As the match gets started, Doink The Clown comes out to the entrance area with a big hammer. Doink wasn’t yet officially a heel, but he’d eventually go full heel once 1993 rolled around. During his initial debut however he would just come out and do clown stuff, with subtle hints thrown in that he was a tad more sinister than he was letting on. For example, at Survivor Series he came out during a match to give kids balloons, only to deliberately burst one before scampering to the back. Cassidy controls things on the mat whilst an inset promo he cut earlier plays over the match. His gimmick seems to be that he’s as white meat a babyface as you could get. His delivery was pretty stilted there and he seemed really nervous. Heaven help him if that was his best take after doing about twenty of them! Poor Cassidy, the crowd couldn’t have cared less about him here, despite him being a more than adequate wrestler. Back to the Event Centre we go for MORE Survivor Series hype. You think they really want us to buy this pay per view or something? We get a promo from Owen Hart and Koko B. Ware, who say Samu and Fatu won’t know what hit them at Survivor Series. We also get promos from Rick Martel and Tatanka, who will be fighting over feathers at Survivor Series. Yes, I’m serious. Back from the break, Heenan cuts another promo on Savage and Perfect, saying that they’ll meet their demise at Survivor Series. 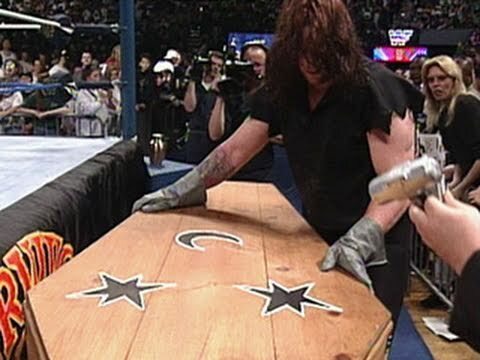 McMahon then sends to a promo from Paul Bearer and Undertaker at their funeral parlour, where we see Undertaker has a special coffin prepared for Kamala. This was really camp and silly but, for whatever reason, Undertaker is really the only character who can get away with that sort of stuff. Undertaker closes the coffin’s lid on the camera as we fade to black. Being the go home show for the Survivor Series, this show was mostly hype for that event. I can’t say that is especially made me want to go out of my way to watch Survivor Series 92 again, but you can’t blame the WWF for actually trying to get people interested in a big pay per view event. Most of the big matches at Survivor Series got a decent amount of hype and the matches on offer were generally good. This was 45 minutes that flew by, but there’s better stuff to watch on the WWE Network if you want an hour to kill. Before you go, how about you take a look at Dom’s review of the Resi II remake? 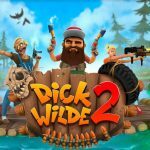 Apparently all the cool kids are talking about what a smashing game it is, so why not get the skinny yourself by clicking right HERE?